It's been a pretty busy week. First up, we were at Magna Science Centre is Sheffield on Day 1 of the Games Britannia festival, aimed at introducing UK school-children to the art and business of making computer games. 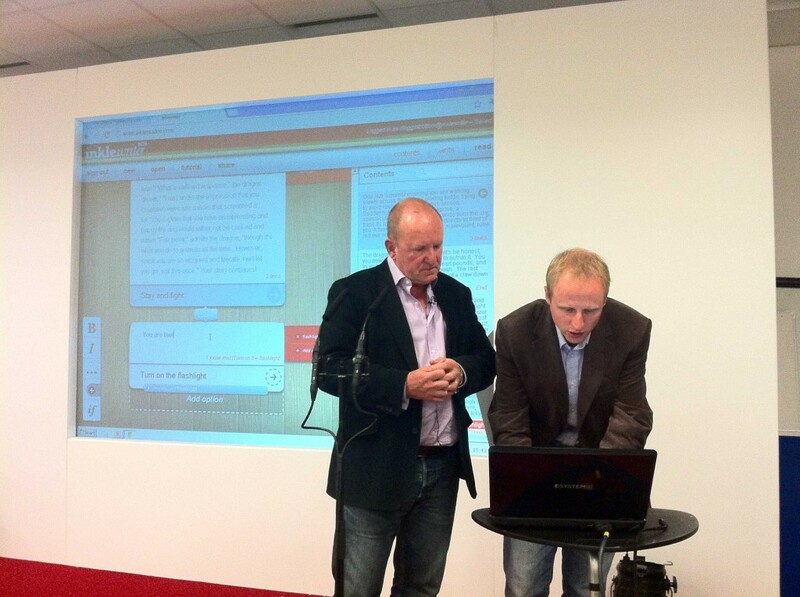 We ran a one-day workshop on inklewriter alongside industry legend Ian Livingstone, who helped the kids to plan their stories, which they then got up and running with our tool. It was a tonne of fun, and the kids seemed to get to grips with the idea very quickly. They even managed to track down one or two of inklewriter's nastier bugs, so that was a real treat for us -- if a little bit frantic at times! Hopefully some of the stories started that day will make it all the way to the Future Voices competition. Then it was straight on to Germany, where we were giving a talk at the Pixel Lab workshop near Potsdam hosted by Power to the Pixel, to a group of cross-media specialists working on developing projects across Europe. Our talking was on the business of making experiences for tablet devices - what to look out for, how to bring in an element of theatre, and how to avoid your app feeling too much like plain old software. The talk followed on from one game design by Martin Elricsson who's worked with the likes of Joss Whedon, so it was a little bit nerve-wracking! Lots of questions from the audience about Frankenstein - how was it pitched? How was it funded? Did people think it was a game? Did people get to the end? Finally, I chatted with Gamasutra's Leigh Alexander last week and the interview has gone live, bringing in quite a few new visitors to inklewriter. Hello, and apologies if we haven't had time to respond to your comments yet - it's been a bit hectic around here!